Plate with blue transfer printed scenes of Brooklyn, New York. 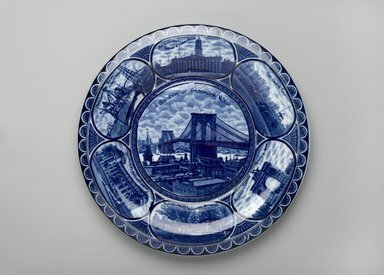 In center of plate is composition focusing on the Brooklyn Bridge with a prospective taken from the Brooklyn side; amidst the clouds, near top of composition is: "SOUVENIR OF BROOKLYN, N.Y.; around the bottom edge is: "NEW YORK & BROOKLYN BRIDGE". A blue and white demi-lune border frames the central circular composition, with triangles in their centers and evenly spaced white dots outside the border. Six ovoid-shaped areas divide the rim, each framed with blue borders, and each containing diverse vistas of Brooklyn. At top (12:00) is the Brooklyn Court House, and at top left horizon is: THE CITY HALL, SQUARE & COURT HOUSE"; followed next (2:00) is a vista of a park and at top is: "FORT GREEN PARK"; followed next (4:00) is the arch at Grand Army Plaza, and at top is: "SOLDIERS & SAILORS MEMORIAL ARCH", next (6:00) is a park vista which is: tree-lined with pavilions, and at top is: "PROSPECT PARK BOULEVARD ENTRANCE"; next (8:00) is a partially- completed Brooklyn Museum, at the top is "INSTITUTE OF ARTS & SCIENCES"; next (10:00) is a view of a docked ship, and at top is: "BATTLESHIP "MAINE" IN NAVY YARD". CONDITION: Very good; little wear around bottom of plate; glazed surface very good.